A national expansion of competency-based learning takes place that recognizes measuring academic progress based on demonstrations of what students know and can do. 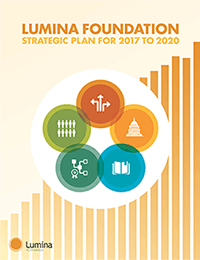 Lumina’s work has shown that many of the Americans in the some college, no degree population understand the value of a postsecondary credential and want to earn one, but face significant challenges in doing so. In many cases, these potential students hold credits from several institutions and have picked up valuable knowledge and skills on the job or from alternative providers. Often their interests and circumstances have changed, and they require a different pathway to a credential than the one they started on. Our work has shown that well-designed, high-quality competency-based programs—along with other innovative delivery models such as completion colleges and open-source online programs—can help these Americans obtain high-quality postsecondary credentials. The emerging national system of transparent postsecondary credentials offers new opportunities to expand these approaches so that all Americans have access to pathways that meet their needs and lead to quality credentials. For maximum effectiveness, competency-based programs should be connected to efforts to encourage adults with some college to return and complete a credential. State data systems—provided they are robust enough—can identify these students. The development and wide-scale implementation of new approaches to recognize learning beyond high school however and wherever it is obtained would also help create pathways to competency-based postsecondary credentials. Together, these models can help millions of Americans obtain high-quality credentials.